Indeed, one of the aspects of the leatherback turtle which make it unique is its size. Growing up to 7 feet long and weighing up to 2,000 pounds, leatherback turtles are the largest turtles on Earth. Part of what makes them such a majestic sight is that they are so rare. 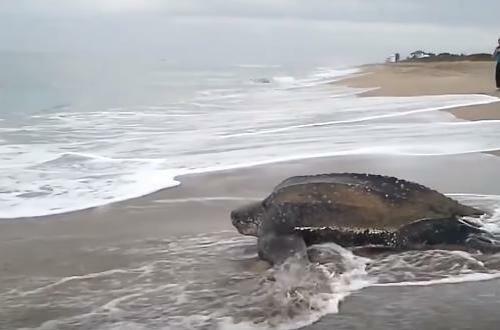 In fact, leatherback turtles are among the only remaining members of a species of turtle that has been known to exist for over 100 million years. Leatherback turtles were once common, existing in every ocean except for the Arctic and Antarctic. However, this has changed over time and the population of the leatherback turtle is rapidly decreasing today. Concerned about the future of the species, conservation groups have become involved. They hope to preserve these amazing turtles for years to come. Leatherback turtles mainly live in the Atlantic and Pacific Oceans, usually near the equator. Some can also be found in the coast off of Central America. The turtles crawl out of the water and walk onto land to lay their eggs in the sand. Once they have done that, they head back into the ocean. Take a moment to reflect on the current situation for leatherback turtles. What do you like most about them? What do you think we can do to help preserve the species? How do you think leatherback turtles have managed to survive when most other species of turtle from 100 million years ago are extinct? Show this article to a friend and encourage them to share their thoughts with us as well.